AJ Fletcher Theatre, Duke Energy Center for the Performing Arts. Click here to submit your payment. A deposit amount of $265 is due by March 29, 2019. The balance ($230.00) will be due by May 9, 2019. If you cancel on or before May 9, 2019, you will receive a full refund less a $150 cancellation fee. If you cancel after May 9, 2019 there will be no money refunded. Scholarship applications are due by March 29th. Students will be asked to sing a prepared one minute/16-32 bar song cut of their choice (any style). An accompanist will be provided; please bring sheet music. Students may also sing their selection a cappella. 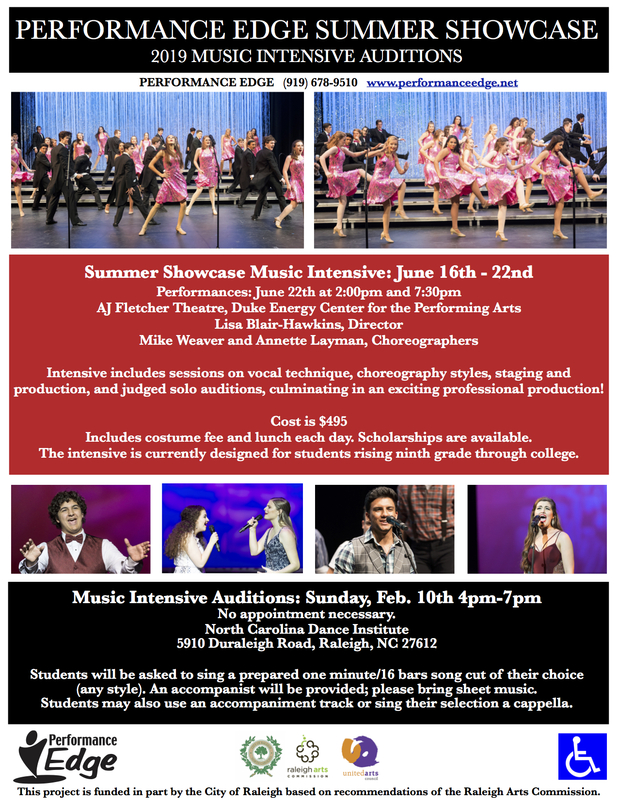 The Summer Showcase is an auditioned, intensive, week-long music camp, held in June each summer and is comprised of concentrated sessions on vocal technique with the musical director, choreography styles with guest choreographers, staging and production, auditioning techniques, and separate judged auditions for spotlight solos. All participants learn music, staging and choreography. Musical styles range from a capella to ballad to fully staged production numbers, and the intense music camp culminates in a large scale performance.